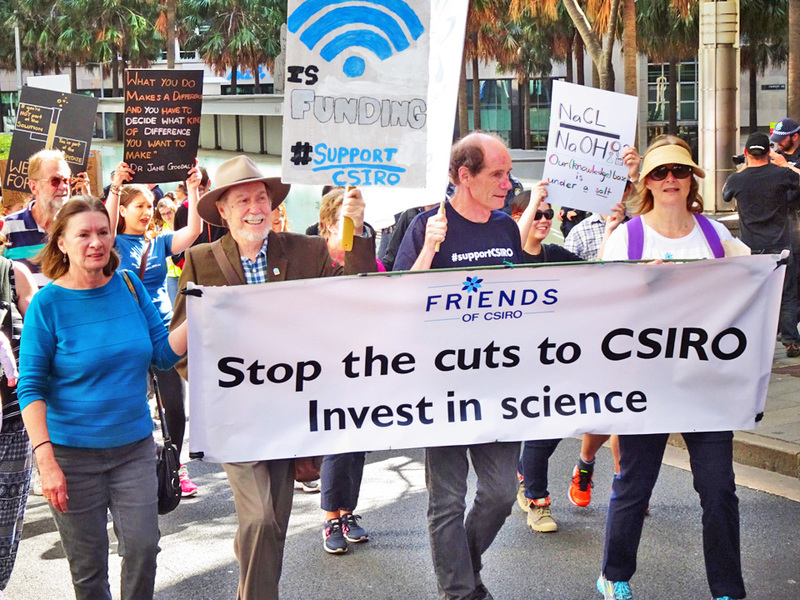 Friends of CSIRO is a network of concerned citizens who are campaigning to restore critical funding to CSIRO and reverse the job cuts. Friends of CSIRO has been formed in response to the ongoing cutbacks to CSIRO’s funding over recent years, and in particular, the recent announcements that CSIRO will cut 275 jobs in a number of divisions, including from the crucial Oceans and Atmosphere and Land and Water divisions. Friends of CSIRO has members in QLD, NSW, Victoria, Tasmania and the ACT and is quickly becoming a national organization. Friends of CSIRO is growing rapidly as the public expresses its opposition to the CSIRO cutbacks. Want to find out what we are up to? 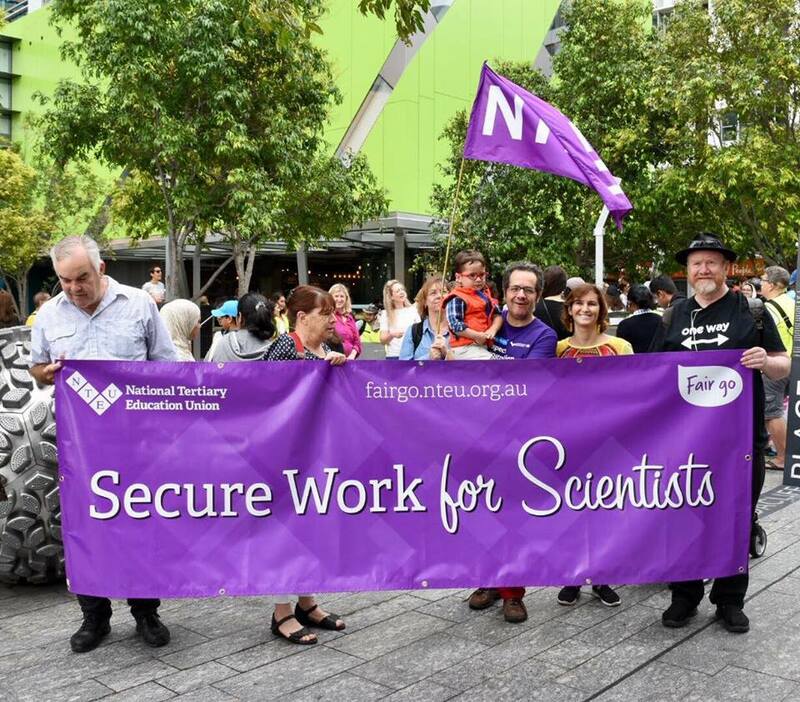 Stand up for science and come join us for a drink and a chat about the campaign to save public good research. 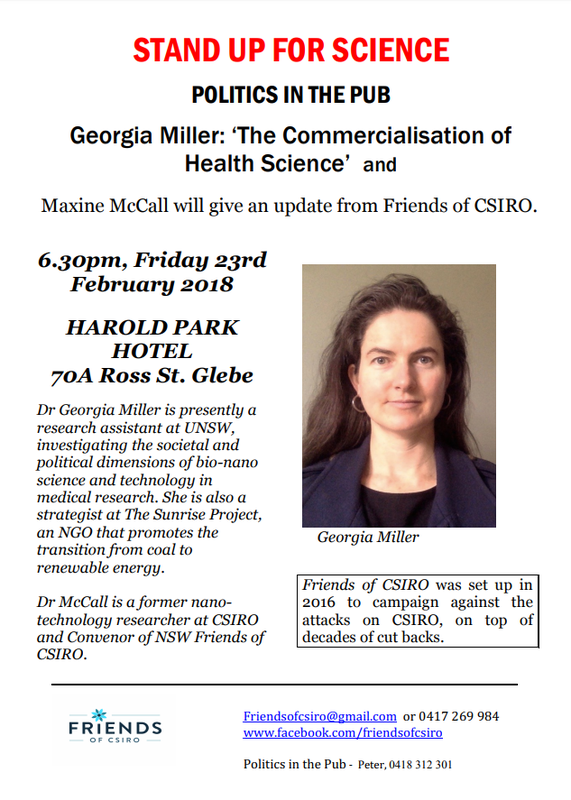 Dr Maxine McCall will give an update on the Friends of CSIRO campaign and introduce Dr Georgia Miller for the evenings topic of discussion, 'The commercialisation of Health Science'. We would love to see you and all welcome. On the 22nd April 2017, Friends of CSIRO joined concerned citizens from all over Australia for the global March For Science rallies. The March for Science rallies were held in over 600 cities all across the world, and held on Earth Day. The March for Science rallies were held to celebrate science and acknowledge the contribution of science to our every day lives. The rallies were held to call for evidence-based policymaking, government funding for scientific research, government transparency and government acceptance of the scientific consensus on climate change. Friends of CSIRO were very happy to be a part of this great movement, and hope that our politicians and policymakers recognise the wide community support for public good research and for our wonderful scientific institutions such as CSIRO and many others. Friends of CSIRO media release responding to the proposed 1.3 billion cuts to ARENA in the Omnibus Bill. This will mean further cuts to CSIRO which will have a devastating impact on Australia's renewables research capacity. View pdf here. Friends of CSIRO will be holding a meeting to set up Friends of CSIRO group in Sydney, followed by a film screening. Refreshments provided. Further details will be provided shortly. All welcome. A. The Prime Minister, The Hon. Malcolm Turnbull, and let him know what you think about the proposed CSIRO job cuts. B. The Minister for Industry, Innovation & Science, The Hon. Greg Hunt MP. To find your local MP/Senator use the Parliament of Australia link. Please sign the CPSU petition calling for the job cuts to be reversed, the change.org petition calling for the job of CSIRO scientist and sea level rise expert, John Church to be reinstated, and the petition calling on the Liberal and CSIRO management stop decimating our CSIRO. 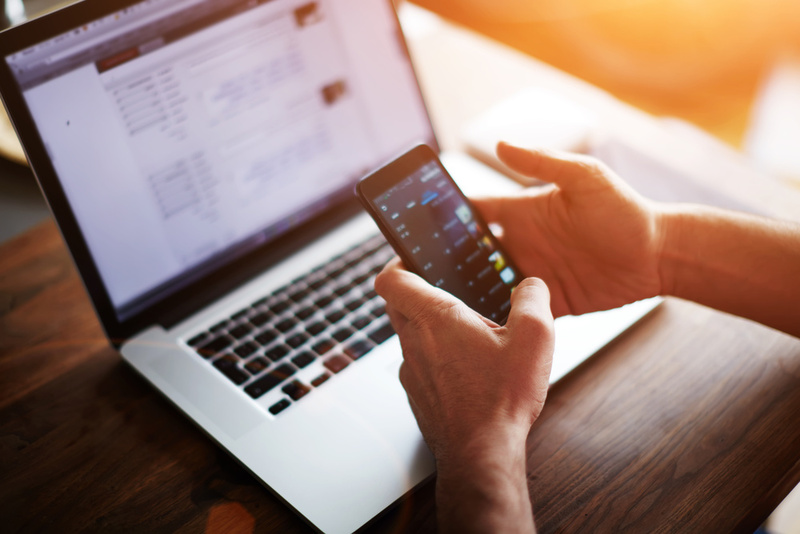 Add your voice to growing list of concerned members of the community. You can volunteer with friends of CSIRO and join a local branch in your state. We will be running events all over the country and can always use an extra pair of hands to get the message out to the community. Like us on FACEBOOK & invite your friends to like the page too.